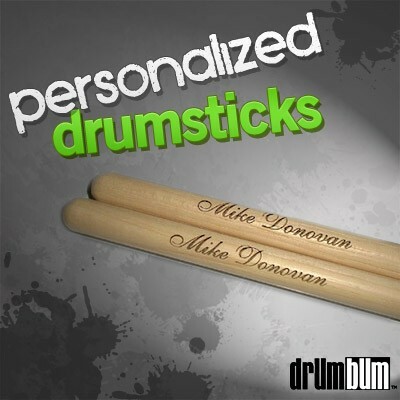 Personalized Drumsticks – Custom Drumsticks with YOUR NAME on them! – Be the star of the show with these quality engraved drum sticks. Throw them out to the audience. They love free drumsticks. An awesome gift idea for the passionate drummer in your life! Personalized Drumsticks are available in the most popular 5A size. High quality custom drumsticks by a leading manufacturer. Professionally “laser” engraved (not screen-printed) custom sticks. 30 characters limit (including spaces) per line with a maximum of 2 lines per stick. Font is Monotype Corsiva. – 1 pair of drumsticks, Wood tips. *Please note: This is a custom, personalized item and is non-returnable. *Please put the name to be engraved in the “order notes” box when checking out. Need pricing on bulk custom drumsticks for business, promotional or band merchandise tables? Click here for bulk custom drumsticks ordering.